Quiet reading time took on a new dimension last week. As well as all the regular reading activities, I noticed a group of girls in unusual reading poses. I think that they were attempting this. The girls had looked through a pile of books on my story chair and found a book that they had not made it's way to the bookshelf. This book has won 8 different awards. Click in the image to go to the abcyogaforkids website. 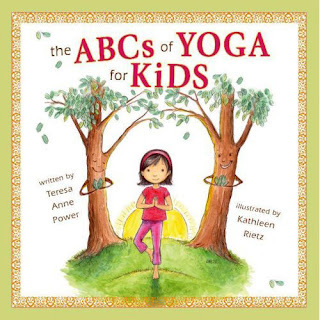 I guess that if you look at a book that connects yoga poses to letters of the alphabet and different animals, you just have to try them out! Quiet reading time finished up with a cobra pose. We talk about 3 different ways to read a book: reading the words, reading the pictures, and retelling the story. These kidlets were working together and reading the pictures to learn something new. I was a happy teacher. I do yoga with my kid after lunch to calm them down before story time. We have been cautioned about doing "yoga" - do we do "stretching" and "pretending"! Thanks Liz - I just had a look at her website. If you ever hear about a yoga with kids workshop for teachers that she is offering in Nanaimo - could you let me know. I would be interested to go.